Blog — Preferred Roof Services Inc.
October 05, 2012 / Preferred Roof Services Inc.
Whatever it is you do in life there are always moments and opportunities to help others and make their lives better. We call this a "hero" moment at Preferred Roof Services, Inc. Recently we were called out to look at a roof on Lake Louise, Lakewood, WA. When our sales representative Nickolas arrived he found a very troubled homeowner that was distraught over a recent contractor experience. She asked Nickolas to take a look at her roof explaining that a "professional roofer" had just finished a torchdown roofing system the week before. We took a look at the roof and were completely appalled at what we saw. 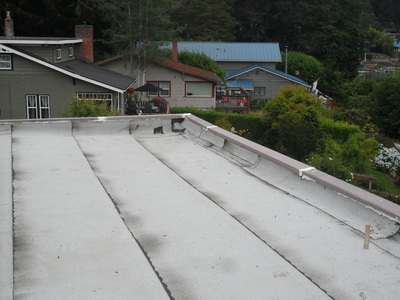 You can see from the picture below that the installer was certainly not a professional roofing contractor in Lakewood, WA. In fact they seem to know very a little about installing torchdown at all! Above is a picture of the torchdown roof that was installed two weeks before this picture was taken. The roof system was failing and needed to be replaced. You can see in the top right hand corner that the workmanship and application was done poorly. Pictured here is our new flat roofing system utilizing a Weatherbond 60 mil TPO roofing system. This system is in all ways superior to the failed roof we replaced and our homeowners were happy! We provided a professional roof installation that was watertight and does not leak. We utilized a Weatherbond 60 mil TPO roofing system that provides a 50 year material warranty. The white membrane has a high reflectivity rate and will help to reduce power bills by reflecting the suns rays off of the building. This in turn keeps the the temperatures in your home cooler. This was the perfect solution for our customer! Preferred Roof Service is a Lakewood roofing contractor that specializes in all types of roofing. We have over 50 years of combined experience in the roofing industry and can install just about any residential or commercial system you can think of! Call us today to schedule your flat commercial or residential roofing estimate. Call us today at 253-318-8918 to schedule a free estimate or click on the link below receive a complementary roof valuation.